As I sit to write this, I’m looking outside at perhaps the most beautiful day we’ve had since moving to Duluth. It’s above 50 degrees (yay! ), the sky is blue and I saw a robin this morning. And the robin was fat, which I’m taking to mean he’s found some nice worms, which means the ground it thawing. This I am VERY excited about as I plan to plant a garden this year. I’ve come to realize however, in the far north, you must first start your seeds inside and then transplant them outdoors once the chance of freeze has past for good. So last week I went and bought me a seed tray, dirt and seeds. SO EXCITED!!! I plan on doing my planting this weekend. Choosing what to plant proved to be a bit more difficult than I first anticipated. I only have a small space and wanted to utilize it to the max! Fill a pot with water and bring to a boil. Fill a large bowl or pot with half ice and half water. When the water comes to a boil, add the broccoli florets using a strainer with a handle if possible. Allow the broccoli to cook for 1 to 2 minutes until just tender. Immediately remove from the boiling water, using the strainer or draining, and transfer to bowl of ice to stop the cooking process. Immerse the broccoli completely in the ice water for a minute or two. Remove and place in a dish that has been lined with paper towels. This part can be done up to two days in advance. In a cup or small bowl, mix together the Parmesan cheese and brown sugar; set aside. Heat the oil in a large skillet over medium-high heat. Throw in the broccoli and season with red pepper flakes, salt and pepper. Stir to coat the broccoli, then cook and stir for 1 to 2 minutes. Remove from the heat and dust with the Parmesan cheese mixture. Biggest tip I learned was while the steaming and shocking with cold water did retain the brilliance of the broccoli, I think it was an unnecessary step. Several reviews that I read said you didn’t need to steam then saute, but I decided to do it anyway. Next time I won’t. I think it made the broccoli a little mushy (maybe I steamed too long) and really, just made more dishes for me to wash! I found the sugar to be unnecessary. I didn’t notice any benefit to it nor did I notice an added sweetness. Just empty calories. Boo. After recently discovering the deliciousness that Parmesan cheese adds to brussels sprouts, I was pretty sure it would be the star ingredient of this recipe. And it was. I think this would turn out much better with just sauteing the broccoli and adding the cheese, salt and pepper. Pretty simple. It was a pretty green though. My actual Zucchinis prior to baking!!! Line a baking pan with aluminum foil and place the zucchini boats on the foil. Arrange the cherry tomatoes, olives, and goat cheese alternately on the zucchini. Drizzle with a little olive oil and sprinkle over half the basil leaves. Bake for 20 minutes and serve immediately. Garnish with the remaining basil leaves. I pretty much took this recipe as a guide and made tons of changes based on what I had on hand. Instead of goat cheese, I used Feta (YUM!). I didn’t want to buy cherry tomatoes just for this recipe so I diced up a roma tomato instead. Worked great. Finally, I don’t have any fresh basil growing at the moment and I can’t bring myself to spend $3.50 on the packages at the store so I used dried basil instead. 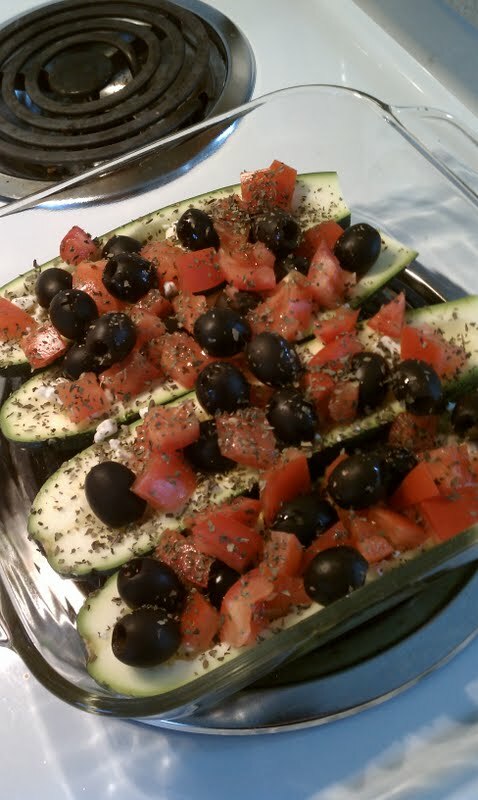 I lined the bottom of the zucchini boat with the feta cheese and placed the tomato and olives on top. After alternating the veggies, I realized that it probably wouldn’t be very filling so I just piled the tomatoes and olives on. Not super pretty, but gets you the most bang for your buck! I also didn’t bother with the aluminum foil. Fresh Basil really would make this extra yummy. I can’t wait to have some growing soon. I will admit I didn’t really have high hopes for this dish. It didn’t sound very flavorful to me and I wasn’t sure how it would turn out. After the first bite my response was “WOW!!! !” Holy Smokes. They were AMAZING! Something about how the tomato and olive baked in the oven with the way the feta melted slightly was really, really good. This dish was fresh and just made you feel down right good about eating it. Alls I can say is we will be eating these again soon and zucchini just made it onto my garden planting list as I would love to have a supply to get me through the summer. This would probably make a great grilling entree as well. SO GOOD. Five Stars all around!!! Haha! I laughed at the last part. I know you are anxiously awaiting the recipe so here it is. Thanks Kristen for sharing!! 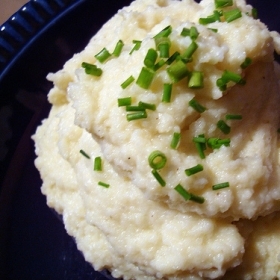 It was delicious, everyone loved it and it can’t get much simpler to make! 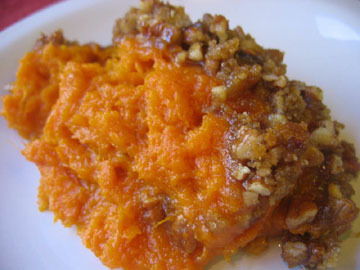 I can’t wait to try this recipe myself as Ava is a lover of sweet potatoes and I’m a lover of all things delicious! Sunday. So we tried an artichoke tonight. Fail. I’d been at the grocery store this week perusing the produce isle, trying to decide what to try as my next vegetable. Everything looked so plain, so boring, so… last week (I kept seeing lots of brussels sprouts apparently). And then my eyes befell the artichoke. Brilliant! Something new and enticing. Have you ever seen one of those things?!?! How the heck do you eat it??? I was set to find out. I bought one (for an astounding $2.98!!) and headed home with my find. I basically just cut and paste the entire thing, pictures and all. I REALLY hope that’s not illegal! Slice about 3/4 inch to an inch off the tip of the artichoke. Pull off any smaller leaves towards the base and on the stem. Cut excess stem, leaving up to an inch on the artichoke. The stems tend to be more bitter than the rest of the artichoke, but some people like to eat them. Alternatively you can cut off the stems and peel the outside layers which is more fibrous and bitter and cook the stems along with the artichokes. Rinse the artichokes in running cold water. In a large pot, put a couple inches of water, a clove of garlic, a slice of lemon, and a bay leaf (this adds wonderful flavor to the artichokes). Insert a steaming basket. Add the artichokes. Cover. Bring to a boil and reduce heat to simmer. Cook for 25 to 45 minutes or until the outer leaves can easily be pulled off. Note: artichokes can also be cooked in a pressure cooker (about 15-20 minutes cooking time). Cooking time depends on how large the artichoke is, the larger, the longer it takes to cook. You don’t have to snip the ends off like the video says. It’s just for astetics. The simplyrecipes instructions also said to do that, but noted that the pricklies soften during steaming. I steamed mine for about 20 minutes. I had read that if you can insert a knife with the ease of that with a baked potato, you are done! Jeff and I made the mayo and balsamic vinegar sauce. That was delicious! Well, there’s not much to an artichoke. You basically get a little tiny bit of flesh with each leaf. The mayo sauce we made was delicious and probably the reason we kept eating the thing, but for a side dish for dinner, not so great. This would be good if you were having a fancy smancy dinner party and wanted an uppity appetizer, but for a regular meal, it was too much effort for little return. Plus, I didn’t think the flavor was out of this world or anything. So, in conclusion, we won’t be making artichokes again anytime in the future…unless we are invited to a fancy smancy dinner party! It was, however, an interesting experiment and I now know more about the artichoke. My actual Sprouts! they are so pretty... and delicious!! The great thing about this page is that it actually lists the recipe I was trying to replicate last week, so if you were fearful of my attempts at recipe writing, no fear, the original can be found here. Remove any ragged or old-looking outer leaves on the brussels sprouts and discard. Parboil the brussels sprouts (or steam them) for 3 minutes or until just tender. They should be almost cooked all the way through (split one in half to test). 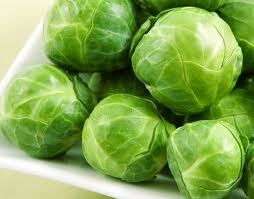 Strain the hot water and place the sprouts in a bowl of ice water, this will keep their color bright green. Cut the sprouts into halves. Heat 2-3 Tbsp of butter in a large sauté pan on medium heat. Add the onions and cook until translucent, about 4-5 minutes. Add 2-3 Tbsp more of butter and the brussels sprouts halves. Increase the heat to medium high and cook for several more minutes. Salt and pepper to taste, while the brussels sprouts are cooking. Do not overcook! Overcooked brussels sprouts are bitter and are the main reason why some people don’t like them. Remove the pan from the heat, stir in the lemon juice and half of the toasted almonds. Add salt and pepper to taste. Place in serving dish and garnish with the rest of the toasted almonds. Serves 6-8. I substituted olive oil for butter to save myself some calories. It really didn’t take very long to saute the sprouts once I got them in the pan. I was really nervous about overcooking them since is said they would get bitter, but didn’t want to under-cook them either… so stressful! Jeff had been in charge of steaming them and cutting in half and was the one to say they were probably done after three or four minutes in the pan. They turned out beautiful! I didn’t have toasted almonds, only regular almonds I chopped up. I didn’t have time to toast them, but it didn’t seem to matter much, they were a great addition! In looking over the other recipes from the I LOVE Brussels Sprouts website, one of the recipes called for you to toss cheese onto your sprouts. Since I’m a cheese nut, this sounded like the best advice in the world to me. And it was. I added grated parmesan cheese (just the kind out of the shaker!) and it was DE-LIC-IOUS!!!! A definite must! These were GREAT brussels sprouts! I can’t rave enough about them! I loved them. Jeff thought they were delicious as well. We will so be having these again in the near future. I hope you give them a try. They really were wonderful! Hooray for Brussels sprouts! This under-appreciated veggie may soon be taking on a new place at our dinner tables once again! 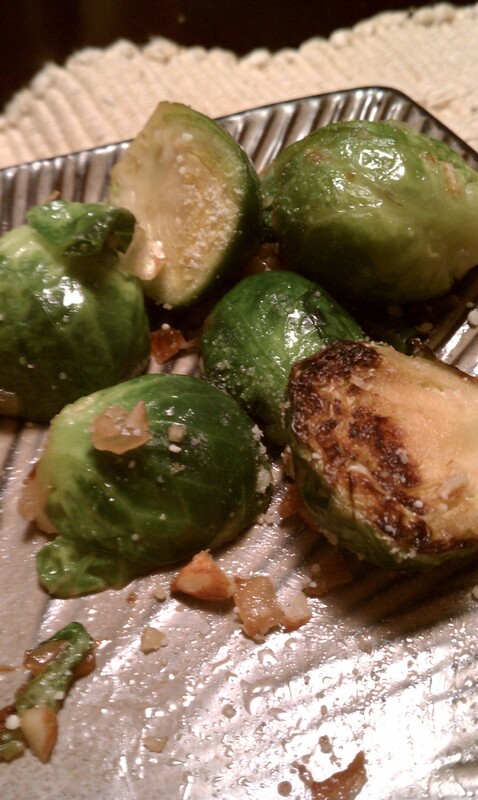 Brussels Sprouts… they’ve gotten a bad rap, eh? Images of small children running screaming from the dinner table… Opie Taylor saying “Ahhh, gee” to Aunt Bea when he finds out what’s for dinner. Brussels sprouts. What’s the deal? I don’t know. I’ve never in my whole life eaten a brussels sprout. Not until last week that is. We spent the weekend in Minneapolis visiting Jeff’s family. His sister and brother-in-law treated us to a homemade Valentines Day dinner, complete with brussels sprouts. I thought they were pretty good! And so cute too. It’s like a little mini cabbage, bite size! I had watched Julie make them and decided I should give it a try at home. It didn’t seem too hard. Cut the ends off the brussels sprouts and cut in half length wise. Heat oil in a large skillet. Once oil is hot, place sprout halves face down. Add garlic. Let the sprouts cook for several minutes, until bottoms are browned. Remove from heat and toss in Balsamic vinegar. I may have done well to get the exact recipe/ instructions from Julie because mine didn’t turn out exactly like hers. There may be a couple reasons for this. One, I don’t think she used olive oil (maybe grape seed oil? )Two, I may have had my heat up too high. Let the sprouts sit for a few minutes after cooking. I had tried one right out of the pan and it was a bit too crunchy (disappointing), but after sitting for a few minutes while we ate our meal, they softened up a bit. Salt was a good addition. I’m going to give this one another try. I didn’t totally bomb it and they turned out ok in the end. I may need a few tips from Julie next time. AND since I still have half a package of brussels sprouts left over, who knows, you may be getting another sprout recipe next week! Stay tuned for more from this under appreciated veggie!